Heat oil in large saucepan over medium heat. Add onion; cook 5 minutes, stirring occasionally. Add bell peppers and garlic; cook 5 minutes, stirring occasionally. 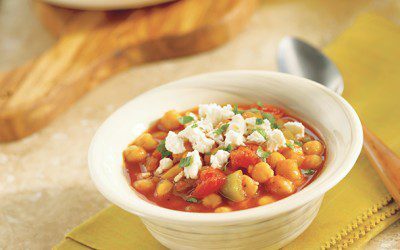 Stir in chickpeas, tomatoes with their juices, vegetable juice, and red pepper flakes; bring to a boil over high heat. Reduce heat to low; simmer, uncovered, 12 minutes or until vegetables are tender. Ladle into shallow bowls; top with feta cheese and basil. Exchanges per serving: 2 Bread/Starch, 1 Fat.